Incheon is one of South Korea’s major cities and is located close to the capital city of Seoul. The city is easily accessible from both the Incheon International and Gimpo International airports. The city of Incheon is also country’s major port, and its proximity to Seoul adds up to its importance. The city has many skyscrapers and architectural marvels, including Incheon Bridge. At the same time, Incheon has many places of historical, cultural and religious importance like Bomunsa and Jeondeungsa Temple. Or if you are more of a person close to mother nature, visit Incheon Grand Park or Songdo Central Park. Incheon has many places with beautiful landscapes – it’s a matter of how you explore them out! Start with a visit to Wolmido – a small port city with beaches and an amusement park. Ferry connectivity to nearby small yet beautiful islands is available from Wolmido port. Muuido, Yeongjong and Ganghwa Islands are worth a visit. Incheon has preserved many places of historical importance – like Memorial Hall for Incheon Landing Operations, Independence Memorial Hall and Gwangseongbo Fortress. If you are travelling around the city after sunset, you would be amused by the view of well-lit Incheon Bridge in its full glory. To explore more of the city’s nightlife, start with the streets of Guwol-dong. 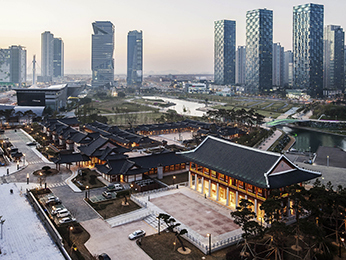 In the day, you can engage yourself in a visit to the Liberty Park, or do shopping around Buppyeon district, along with a visit to the Chinatown.